1 Only about 56% of students earn degrees within six years. The National Student Clearinghouse, a nonprofit verification and research organization, tracked 2.4 million first-time college students who enrolled in fall 2007 with the intent of pursuing a degree or certificate. 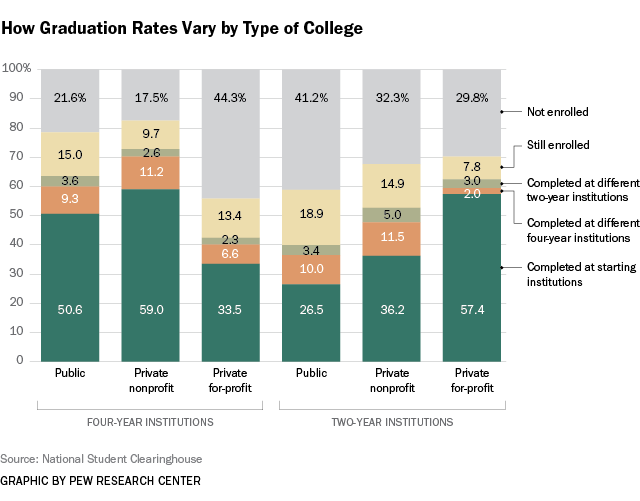 The completion rate was highest (72.9%) among students who started at four-year, private, nonprofit schools, and lowest (39.9%) among those who started at two-year public institutions. 2 Business is still the most common major. According to the National Center for Education Statistics, about a fifth (20.5%) of the 1.79 million bachelor’s degrees conferred in 2011-12 were in business. Business has been the single most common major since 1980-81; before that, education led the way. The least common bachelor’s degrees, according to the NCES, were in library science (95 conferred in 2011-12), military technologies and applied sciences (86) and precision production (37). 3 It’s harder for new graduates to find good jobs. It’s no secret that unemployment among recent grads remains higher than it was before the Great Recession. But in a recent report, the Federal Reserve Bank of New York went deeper and looked at underemployment among recent grads (defined as people aged 22 to 27 with at least a bachelor’s degree). The Fed researchers used data from the Census Bureau and the Bureau of Labor Statistics to examine whether employed grads were in jobs that typically required a college degree, what those jobs paid, and whether they were working full- or part-time. They found that in 2012, about 44% of grads were working in jobs that didn’t require a college degree — a rate that, while about what it was in early 1990s, increased after the 2001 and 2007-09 recessions. Only 36% of that group were in what the researchers called “good non-college jobs” — those paying around $45,000 a year — down from around half in the 1990s. The share of underemployed recent grads in low-wage (below $25,000) jobs rose from about 15% in 1990 to more than 20%. About one-in-five (23%) underemployed recent grads were working part-time in 2011, up from 15% in 2000. 4 But graduates still out-earn people without degrees. 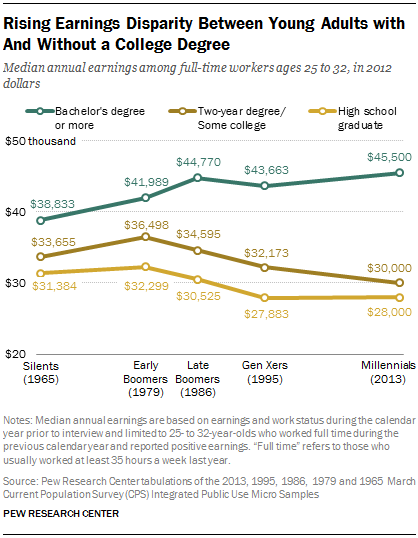 A Pew Research Center report from earlier this year looked at earnings of Millennials (those born after 1980) who usually worked full-time in 2012. Among that group, workers with at least a bachelor’s degree had median annual earnings of $45,500, well over the medians for people with only some college ($30,000) or a high-school diploma ($28,000). The gap has widened over the years and across the generations: In 1965, when the members of the Silent Generation were 25 to 34 years old, median earnings for high-school graduates were 81% of those for college graduates; in 2013, among the Millennials, it was 61.5%. 5 Most grads think college was worth it. The same Pew Research report found that majorities of graduates in all three of the largest U.S. generations — Boomers, Gen-Xers and Millennials — agree that college either has paid off or will pay off, given what they and their families invested in it. Perhaps not surprisingly, the highest-earning graduates were the most positive about their educations — 98% of those making six figures and up said their degree had paid off, compared with 63% of graduates earning less than $50,000. Similarly, people with advanced degrees were even more likely than bachelor’s and associate’s degree holders to say their education was worth the investment — 96%, compared with 89% and 76%, respectively.